Hooman's Blog: Virtual Museum of the Achaemenid Empire! 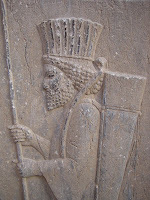 musée achéménide (Achaemenid Museum) is a virtual museum dedicated to the Persian (Achaemenid) Empire. The site is mostly in French but the navigational stuff are available in English. Posted by Hooman at 12:28 a.m.